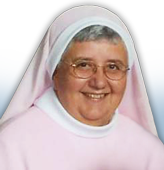 The Heart of Mary Ministry is a Catholic ministry, founded by Sister Mary Lucy Astuto, D.E.F. This non-profit ministry was founded for the purpose of evangelizing, reaching others with the love of God, and helping spread the messages Our Blessed Mother has given us in our modern day. Conviction that founding this Ministry was the Will of God came to Sister Mary Lucy in prayer.Sister Mary Lucy is also a seasoned speaker whose love for God and Our Lady is clearly manifested in her presentations. Humorous, yet very down to earth, she makes profound spiritual realities simple and clear. She is invited throughout the country to provide youth or parish retreats/missions/conferences/days of recollection or short presentations based on the teachings of the Catholic Church, true stories of Eucharistic Miracles, and/or messages of Our Lady.